Pace of play has been one of the major focuses during Rob Manfred’s time as commissioner. Timers have been added for between innings and when new pitchers take the mound. In the minor leagues, a 20-second pitch timer has been used at the Double-A and Triple-A levels since 2015. Major League Baseball wants to see some more changes to baseball’s highest level but the Players’ Association doesn’t agree with these changes. 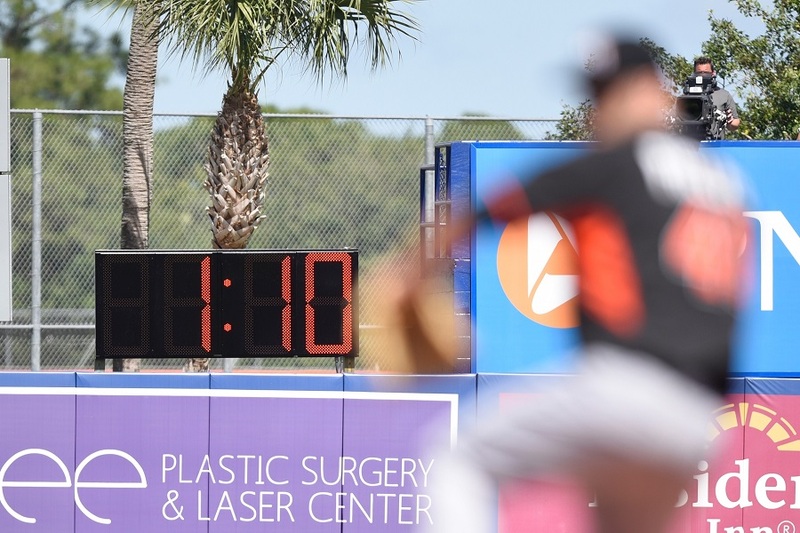 On Thursday, the Players’ Association rejected a proposal to add a 20-second pitch clock and limits on mound visits. These rule changes were proposed last season which means the commissioner’s office could implement the rules without the approval of the Players’ Union. A decision could come as early as the next owner’s meeting scheduled to start on January 30th. Even with attempts to shorten games, the average length of a nine-inning game increased by nearly four and a half minutes. In 2017, it took 3 hours, 5 minutes and 11 second to complete a nine-inning game. Just one year earlier, it was 3 hours and 42 seconds. During last year’s postseason play, the average game took three hours and 29 minutes. The amount of replays also decreased so that wasn’t a factor in adding to the time of games. What are your thought on the potential rule changes? Does MLB need to continue to focus on pace of play? Leave a COMMENT and start the discussion. There's a fine line with pitching mound visits. I agree that fielders running over to the pitcher has been a part of the game forever. However, there should be a limit because some players take advantage of it. I remember in game 163 Gary Sanchez could have created a dirt path walking back and forth from the plate to the mound. I don't have a problem with any of the above proposed rule changes. I think they would all help, but I do question 'what constitutes a mound visit?' If a catcher stands up and takes a few steps to the mound, says something to the pitcher and then throws the ball back and returns to behind home plate, is that a "mound visit?" With no runners on, there is no prohibition against the catcher hanging on to the ball for a few extra seconds, before returning it to the pitcher. At some point, I suspect, the MLBPA will instead want managers, pitchers and catchers to have radio headsets (like they do in football) to communicate. That would indeed speed up the pace of play. Look, MLB needs to find a way to thread the needle between the length of a game and advertising revenue. More rules are not always the answer because enforcing rules can have an impact pace of play and the length of a game. If anything, I find "pace of play" to be somewhat of a deflection from where the problem actually lies. I wouldn't have a problem with a pitch clock and restricted visits but, 1) I'll be pretty upset if this dispute causes some kind of labor issues, and 2) there are better ways to speed up the game. How about cutting the time between half innings? Also, for me the main frustration when a game takes longer is that it ends later. There comes a certain point on a weeknight where I've just gotta pull the plug and head home/go to bed so I'm not a wreck at work the next day. Why not start the games at 6, or at least 6:30, instead of 7:10? SCORCHING Hawt Taek: The pace of play MLB is focusing on now is a distraction for the impending money s***-storm coming up in 2021. Jeff Passan wrote a detailed article about this topic too and mentioned they were proposing cutting half inning commercial breaks to 2 min 20 seconds for local games, 2:40 for national games. How soon before the “capologist” becomes a staple of MLB front offices? hell, I'd like a rule mandating a pitcher must face at least 3 batters, barring injury. the many many pitching changes gets very old. Isn't it 2:25 right now? If they're going to make a stink about it, might as well slice it down more than that. I appreciate the fact that Commissioner Manfred is open to tinkering with some things in hopes of making improvements, but if he pisses off the MLBPA over a bunch of petty changes that's really going to be a drag. I think that a lot of this is politics.The players and the owners are not on the same page, in general, right now and the players want nothing of the backlash those new measures might bring. That said, I'd rather see them get rid of: character races, T-shirt canons, children's games, dedications to veterans, anthem choir and bands, and everything else non-baseball related between innings or before the first pitch, and then try to change the game. Also there are lower hanging fruits than those:the ridiculous number of throws to first base.Even with the proposed rules, someone can throw 10 times without an effect.That's got to stop. I would love if it were 6 or 6:30, but I don't know that they'd ever change it because a lot of people work until 5. Rush hour traffic etc. To have a root cause there needs to be a problem. There is a good number of fans out there who think that there is no problem in the pace of game or the duration of games (Two different things btw). What is next?7 inning games at double headers? Extra innings up to 10 and then either have a tie or have 5 HR derby shots (think penalty shots in soccer)? I would think a 'mound visit' is anything that can't be done within the pitch clock time. If the catcher can talk to the pitcher when returning the ball and they can deliver the pitch before the timer hits bottom, no problem. If they have to call time for the visit, then it's a mound visit. There's never going to be unanimous agreement, so there being a "good number" thinking things are hunky-dory isn't enough reason to do nothing. As for the strawman solutions you raised, they appear to me as being possibly strawmen.